and take up his cross daily, and follow Me." We sat at our kitchen table enjoying supper together...Zachary and me. so we decided to go ahead and eat and not wake him before he was ready. and I happened to make a comment, without really thinking about what I was saying. "I don't think anyone...ever...in the history of mankind...has ever had more anxiety." I have struggled with anxiety for a few years, but, nowhere near to the extreme that I am battling it these days. while trying to come up with solutions and what to do next. the one doing the chasing and the one being chased. That is the only way I know how to describe this. I feel like I will explode. I suppose the jolt happens when the two cars crash into each other and collide. I get up and try to pray and walk around to different rooms and do my utmost to focus on something positive. I attempt to follow the advice that I have given to so many others who are hurting and going through difficult seasons. and I finally get still enough to fall back to sleep. I think some of it has to do with the time of life when "change" takes on a whole new meaning. I feel certain this may have more to do with it than I realize. The other part is coming from Post Traumatic Stress Syndrome and the aftermath of what has felt like a complete or near-complete nervous collapse. So, when I sat at our kitchen table and told Zach that no one....ever....had experienced such anxiety as this, the words came straight from the heart. His reply stopped me in my tracks. The truth of Zach's words hit a nerve. I sat there, letting the full realization completely sink in. Jesus knew what was ahead of Him. His anxiety level must have been beyond the scope of human endurance and imagination. "Zach, you are so right. The prayer He prayed that night was the hardest prayer that has ever been prayed." "That's why He was sweating blood, Mama." (a medical condition called hematidrosis), the level of their anguish has to reach the unimaginable. "Thy will be done", He suffered the most intense of all human anxiety and anguish. Struggling with His Own flesh recoiling from the thought of the physical torture He would soon endure, caused Him to be filled with more dread than you or I will ever be able to comprehend. The daunting realization that if He didn't follow through, mankind would be forever without hope of redemption, weighed on Jesus' heart with a crushing heaviness beyond the scope of tolerance. Yes, my friend, Jesus knows anxiety. He comprehends an anxious heart. He remembers how it feels. During that dreadful night, He sustained more apprehension than any other human in the history or future of man. for a way to avoid drinking the bitter dregs of the cup that awaited Him. All three times, He received the same, dreaded answer. Only You can drink it. Relief came only after surrender. Entire submission....to a will greater than His Own. The express reason...the very purpose for His coming to this sin-blighted world came to full fruition that grievous night. past the scope of our comprehension. Knowing He knows brings comfort. It is seeing me through these sleepless nights and the foggy-headed days that follow them. Saying, "Thy will be done" is not easy. Praying, "Thy will be done" is the hardest prayer one could ever pray. we all possess...that gift God chose to give each one of us called free will. I will never force you to. I hand to you the ability to make your own decisions and chart your own course." So, praying, "Thy will be done" means we are taking that free will and handing it back to God. It means we are deciding that His way is best. I want to live it the way You want me to. I want You to make my choices. I vow to pursue Your path for me. I love You more than I love the control of my own will. I vow to follow You wholeheartedly. I will forever surrender to Your lead. Knowing You do not force me to do this makes me long to do it with all my might. I hand You my will. I want You to chart the course for my life." Jesus prayed the hardest prayer...from the heart...out of the throes of the most intense anguish. He had the same gift God gives the rest of us. God gave Jesus Christ, His begotten Son in the flesh, a free will. Jesus could have charted His Own course. He could have derailed from His Father's mission for His life. He was sorely tempted and offered everything this world has to offer. and He said, "Not My will, but Thy will be done." Herein lies our victory, also. I am finding this is not a one-time surrender. or I can say, "Here, Lord, I am giving it all over to You. It is all in Your Divine plan, and I accept it. Not my will, but Thine be done, dear Lord." thereby gaining peace, does not mean I won't have to repeat those words and that surrender a million times more. Victory in this moment does not insure triumph in the next. When you boil it all down, we would all do well to just surrender to God's will all the time. Because if you think about it, what do we really have control over anyway? Can any of us prevent World War III? never suffer losses, never feel pain? Are any of us capable of fixing our own problems and circumstances? So much of this life, is beyond the realm of our control anyhow. is really a futile effort. It will wear us completely out, and it accomplishes nothing but to keep us in a continual turmoil. There is peace to be found in surrender. There is joy to be discovered in allowing someOne else to take over. Great relief follows the realization that we do not have to do this alone. to the One Who gave it. That God always gives His best to those who leave the choice to Him. I came to the living room to pour out my heart to Him. but also over the past....struggling with wishing we had never subjected Zach to certain undesirable elements, questioning why certain things happened, etc. and the sweetest, most precious, comforting communion with Him ensued. and His Words penetrated straight through the cloud of anxious unrest. "Remember that night in your room when you were 14? I think about it often and wrote about it in this post. that I would live my life as a follower of Jesus Christ. you handed Me the reins to your life. You surrendered your future to Me. I took those reins from you, and you have never asked for them back. Since that moment, I have been in control of your life, child. Everything that has happened has been a part of My plan for you. Don't wonder if you did the right thing. I was holding the reins. you have sought My counsel. You have allowed Me to lead. All of those times you asked Me to show you what to do...I was faithful to reveal the next step to you, and you took those steps. Don't beat yourself up over things that have happened. All of it had to take place to lead you to where you are. You are right where I want you to be. I am in control of your life." but I cannot begin to say how much relief I felt in that moment. To know that HE is in control...that He has been all along. I own the reality of it all. None of what has happened has been happenstance. The things I fret over concerning Zachary and the things he has had to endure were all a part of God's magnificent plan for our lives. oh, the tremendous sense of relief! As He spoke, He took me back to so many spots...crossroads of life....all of the changes. He was there...through it all....directing my steps...making paths straight and plain. The memories were so vivid. I knelt there before Him, and I wept until I shook. I wept because I realized that His guiding, precious hand has always been there. His eyes have always been on the watch. to love Him and to abandon my will in favor of His. I wept because I cringe to think what my life would have looked like had I not heeded their advice, and as a 14 year old surrendered the reins of my own free will over to Him. I wept because I have never loved Him more than I do right now. I am forever thankful that I prayed that prayer when I was 14. It isn't easy to relinquish the control of one's own will back to the One Who gave it. but it will always be the wisest thing in the world to do. I don't ever want to take a hold of the reins. I forever long for Him to lead. it is the only path to real peace. Wow Cheryl!! First of all, how amazing is your sweet son! I love that He was leading you to the truth! SO encouraging! I am so sorry you have been dealing with this!!! Praying you find peace IN the Lord! I so appreciate your honesty! Not sure what happened to my previous comment? I'm with you, sister. I often ponder that it was our Father who inborn us with the anxiety that eventually causes us to seek Him. In our surrender is the only peace we can find and it comes from within because He abides there. I also agree that it is an ongoing process… we never arrive until we reach the other side. I'm praying for you and your family, your son especially. God is preparing him. I am so sorry...I am not sure what happened to it either. It never came through. I love what you said about God allowing that anxiety so that it will eventually cause us to seek Him. That is a wonderful, comforting thought to me. I cannot begin to tell you how much I appreciate your prayers for Zachary. I truly believe you are right. I often tell him that when God opened a barren woman's womb in the Bible and then sent her a son, He always had a special purpose for and calling upon his life. (Hannah/Samuel, Elizabeth/John the Baptist, Rachel/Joseph, Sarah/Isaac, etc.) It means SO much to me to know that you are praying for him and for all of us. You are such a blessing, and I pray God blesses you in return. The words that came to me were, "A little child shall lead them." How often God uses our children to teach us lessons. You are right, our surrendering each situation to God is a continual process. It's something I need to remember, too. YES, I have thought of that verse SO often through the years, as we raise precious Zachary. I cannot begin to tell you of the times he has led us to the truth. The vision of a child is so clear, so pure, so untainted....it pays us to listen to them and never discredit or invalidate their perspective. Thank you for stopping by and for leaving sweet encouragement behind, Pamela! Oh, that is a precious boy you have there! God's hand is on him for sure. Oh, Melanie! Thank you so much for your dear, kind words and sweet encouragement. He IS so very precious...it took so long for him to arrive, but what a dear blessing he is to us now. My words don't seem adequate to thank God enough for him and for all of the other many blessings He bestows. I think of you so often and pray for you and your family. Love and appreciate you so much and cannot thank you enough for your faithful prayers for us. Hello, Rebecca! It is so nice to "meet" you. Thank you ever so much for your visit and for leaving sweet encouragement behind. Yes, I think of that Scripture a lot, too! God bless you for stopping by! Loved how your son brought you comfort with his words! Isn't it neat how our children can just brighten our lives. Praying for you, sweet friend! I too struggle with anxiety and your son's insight blew me away! How incredibly true! I often think about the verse that says, "For the joy that was set before Him, He endured the cross, despising the shame, and has sat down at the right hand of the throne of God." What joy awaited Him, but He had to go through the anguish to get there. How true it is of us in this life, with many sorrows, but our ultimate joy will be when we see Jesus face to face and spend eternity in Heaven where there will be no more tears and no more crying. Thank you so much for sharing! I received much encouragement through this post. Oh Karen! Thank you SO much for this sweet comment! I know what you mean...I have been dumbfounded so many times by Zach's wisdom and the way God speaks to me through him. I could never praise God enough for the gift of being a mother after so many years of struggling and dreaming of being one. I LOVE the verse you shared here. It is so encouraging to me right now. I can't thank you enough for stopping by and leaving such a blessing behind. God bless you richly, in return! So beautifully said Cheryl! I have pondered these same thoughts so many times during those painful moments where I feared His will would be too hard to bear. The same Scripture always comes, "What time I am afraid, I will trust in thee." ~ Psalm 56:3 Trust is an act of faith, faith is acknowledging that His will is being done... I was very encouraged by this article today. Thank you. I LOVE the verse you shared, JES. That is a Scripture that my dear mother used to quote to me so often. OH, how I miss her! You are right...trust IS an act of faith. I am so grateful you were encouraged here. So thankful for you and all you do. God bless you, JES! Jesus paid it all, and he ask us to cast our care on Him. It is so hard to carry anguish, sorrow and pain for yourself, others, extended family and not break. We must give it all to Jesus. I love to fix things and people, but actually we cannot change anyone or anything. It must be their free will choice and God working. May you rest in Jesus and find a person who can pray with you about those thing that press in so hard. Thank you for sharing with us here at Tell me a Story. Oh yes, have you read my 3 part articles on emotions and how to find victory? Hi Cheryl, I love the ending of this devotion. I am pleased God is watching over us. 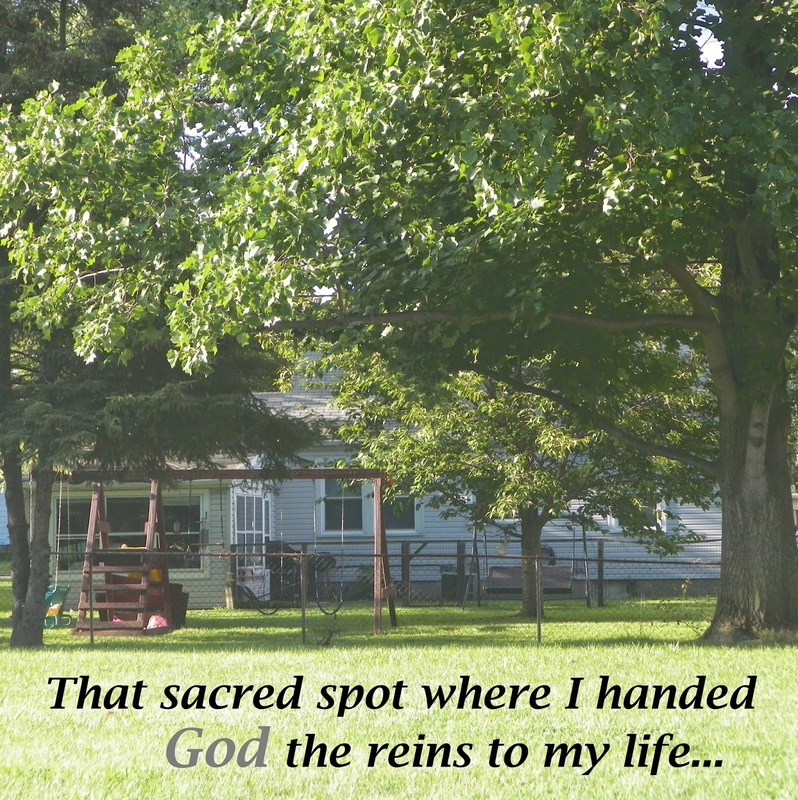 Blessings to you and thanks for sharing in the linkup. YES, praise His name, His eye is always upon us! Thank you so much for stopping by, Ifeoma! There is peace to be found in surrender. That is such a true statement Cheryl. I too have suffered from insomnia mostly cased from anxiety for years. The older I get the more I realize most of my anxiety was cased by wrong thinking, such as I am in control, not God. I now use my insomnia to pray and read until my body feel like sleep is upon it. I chose to not take any sleep aids at this time except some natural meds. This was a very revealing post, honest and pure, thank you for your encouraging words. Oh, Betty! Bless your heart, I am so sorry to hear that you, too, suffer from anxiety-induced insomnia. What a horrible thing to go through....my heart goes out to you in so many ways. Thank you so much for your dear, kind encouragement. It meant so much to me today! God bless you, Betty. Complete surrender can be such a hard thing, but the freedom that one feels with complete surrender is so divine! Hand that anxiety over to the One Most High! Wishing you so much peace. Thank you so much, Laura! So thankful for your words of encouragement and sweet visit today. God bless you! Hi Cheryl! I'm just stopping by to wish you a Happy Easter. May God bless you and yours with his abundant blessings this holy season. Happy Easter and Happy Spring to you, too, Ceil! I was so thankful to see a post from you yesterday and glad to know you are okay. Trusting you are healing and feeling so much better. :) God bless you! This was a very interesting post. You have said some things that I can relate too. Many blessings to you and your family. Good morning! This inspiring post has been *featured* today at the Art of Home-Making Mondays! Thank you so much for sharing with us :) Our new link up is up and running and we would love to have you join in again this week! I am oh, so thankful for the sweet mention, JES!! It made my day to see this! God bless you richly for all you do and for the encouragement you are to me and so many others! Thanks for sharing , you are in my prayers. Thank you ever so much, Leslie. I hope all is well with you and your dear family. I can't thank you enough for your faithful prayers. You are such a blessing to me! How sweet and special that your son spoke those words to you. Blessings to you and your family!